This sweet pongal recipe made with oats is from my mother. Earlier she had tried the savory pongal (ven pongal) with oats and since then I too make it quite often. It’s a quick fix, healthy meal. Recently she tried the sweet pongal (chakkarai pongal) too, using quick cooking oats and told me that it tasted very good and was received well by her friends at work. So I too tried it and we all like it very much as well. 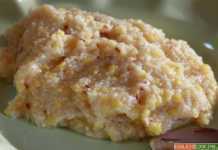 Since the festival Pongal is nearing, I thought I should blog about this oats sweet pongal here. It’s a nice and healthy change from the regular rice pongal. I will post the savory oats pongal recipe too here shortly for the benefit of those who have not tried it so far. 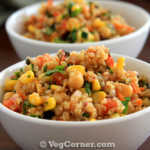 Another healthy variation is preparing pongal using brown rice. The only drawback of using brown rice is that it requires planning and prep work. The rice has to be either soaked overnight or at least for an hour in hot water just before cooking, to ensure even cooking and softer rice. So if you are for this, try this savory brown rice pongal recipe. If not, try making pongal with oats and I’m sure you will enjoy it. Wash the moong dal and drain it. Take a vessel which would fit in a pressure cooker. Add the moong dal, oats and water. Cook it in the pressure cooker for 3 whistles. Meanwhile take the jaggery in a saucepan. Add just 2 tablespoons of water and heat it. Let the jaggery dissolve completely. 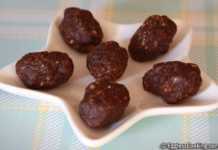 Use a fine mesh strainer to seive the jaggery solution to remove any impurities. Do this at least twice or thrice. Transfer the jaggery syrup to the saucepan again and let it boil. Heat it until one string consistency. At this stage add the cooked oats and daal to the jaggery syrup. Let this cook for another 3-5 minutes or until you get the desired consistency. If you think the pongal is very watery, cook it a couple minutes extra. If you feel that the pongal is quite thick, add some hot water and mix it thoroughly. While the pongal is cooking, heat the 1 teaspoon ghee in a small frying pan. when it is hot, add the cashews and fry until golden brown. Also add the raisins until its plump. Transfer this to the pongal along with the spices and the remaining ghee and mix it well. Oats sweet pongal is ready. Sweets at our home is not overly sweet, so you may want to increase the quantity of jaggery if you prefer a sweeter pongal. 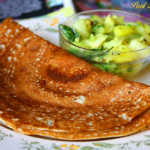 After preparing pongal, if I feel that its not sweet enough I add dark/light brown sugar while the pongal is still hot. That heat is enough to melt the sugar crystals. Just mix it well before serving. Don’t worry if you don’t have a pressure cooker. 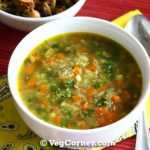 You can prepare this pongal directly on the stove too, but it would take some more time and constant stirring. In a saucepan add the washed moong daal and a cup of water. The daal has to cook completely. You may have to add water as and when the daal starts absorbing the liquid. Do not close the pan with a lid because the water will start overflowing. You can do one of two things now. Either prepare oatmeal as usual and keep it ready to add it to the cooked dal or add uncooked oatmeal to the dal when it is almost cooked. If you do the latter you would have to add some more water for the oatmeal to cook too. 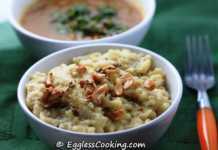 When both the oats and dal is cooked completely, proceed as usual from Step 3 in the Procedure. Traditionally a mixture of freshly ground cloves, nutmeg and cardamom is used for sweet pongal. Since powdering a very less quantity of the same is not possible in my mixer I used the allspice powder I had. Allspice is a Jamaican pepper variety, which has a flavor and taste similar to the combination of equal parts of cinnamon, clove, nutmeg and pepper. I read this website. Really, I am going to try this. I know only sweet pongal . This is the first time I heard about the oats sweet pongal . 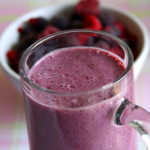 This receipe is really good for health for all ages. My family will love this pongal. A very healthy sweet pongal which I can probably devour without being overly guilty. Well, I need to give it a try though soon. However, I tried cracked wheat sweet pongal and it turned out delicious and so I’m sure this would be yummy too. Thanks for the post. one packet rasins milk 250 ml let boil together with the rice fry in oil cardomn cinnamon stick bay leaves sugar 4 tablespoon and star aniseed pepper powder 1 teapoon cashew nuts one small bowl the white one fry it in oi first honey 1 tablespoonslet boil and our down for 45 mins then turn off stove. 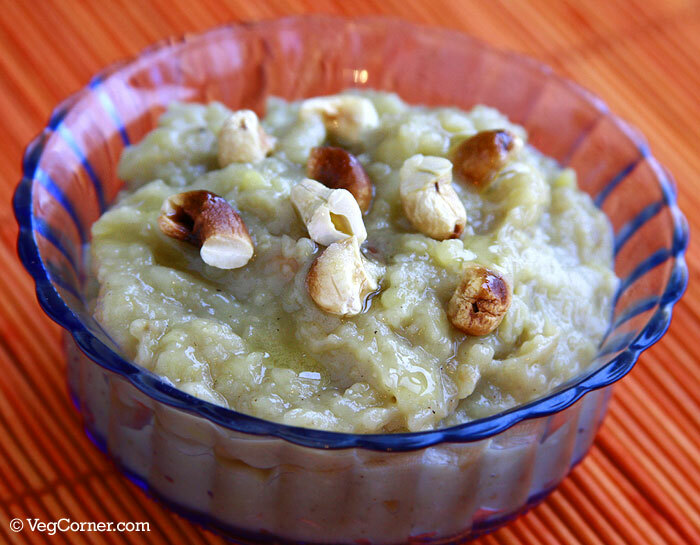 Healthy version of sweet pongal! Congrats to the new blog opening! Celebrating with sweet is a tradition! “Thai pirrandal Vazzi pirakum”- U got it and my best wishes Madhu!